This time of year is when many species (not all such as Lesser Goldfinch or Heermann’s Gull as some examples) begin their mating and you’re likely to hear “songs” and “calls”. 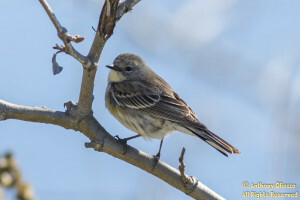 If unfamiliar between the two, songs are usually a longer string of notes offering more of a melody in many cases especially with Warblers. Adult male warblers, such as the male ASY (after second year) Yellow-rumped Warbler, offer a bold colorful presentation during mating season. 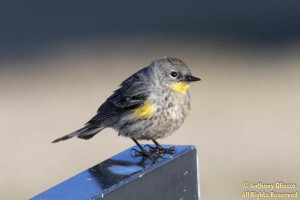 The Audubon sub species of the Yellow-rumped Warbler are found primarily in the mountainous west. 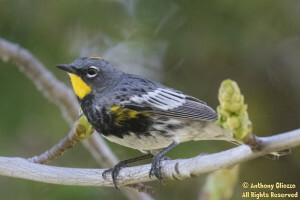 They will offer a yellow throat patch vs. the Myrtle sub species in which the throat will be white. The Myrtle are more commonly found in the eastern US though some have been located here in the west.